Poppy’s Natural Skincare sent me a few products to try and kindly adapted one to my sensitive skin needs. I’ve been testing the Super Moisturising Organic Body Butter (Unfragranced), Super Hydrating Organic Lip Balm in Unscented & Vanilla and the Soothing Neem & Chamomile Balm (this was adapted to exclude linalool). If you are prone to eczema then I’d start with the Neem & Chamomile balm as it’s been formulated with this skin condition in mind. It contains ingredients known for their soothing and calming benefits - Chickweed, Neem, Borage and Chamomile. I find balms are perfect for very dry skin as they are thicker in texture and feel longer lasting (fewer applications). I don’t mind if a product takes a few more minutes to disappear into my skin. This balm feels soft once scooped from the jar and melts easily in contact with warm skin. The body butter is a gorgeous whipped texture making it light and airy. Shea butter has been combined with mango butter, coconut oil, cocoa butter and almond oil so this makes the product very rich and hydrating. For me body butters are perfect for flaky winter skin and I particularly prone to this on my legs. I like to take my time with body butters as they feel luxurious so I apply at bed time allowing the cream to sink in overnight. An unscented version eliminates the worry about sensitivity to essential oils but if you enjoy fragrance then you can choose Neroli or Vanilla. I think lip balms are a staple product in most people’s pocket or bag. I’m not overly fussy what I use as long as it’s natural and easy to apply. The unscented version offers an alternative for sensitive skin but if you like flavours then opt for Lime, Orange Mandarin, Peppermint or Vanilla. Unfortunately the lip balms and Neem & Chamomile balm are not suitable for Vegans due to beeswax but you can opt for the body butters, clays and face oils. 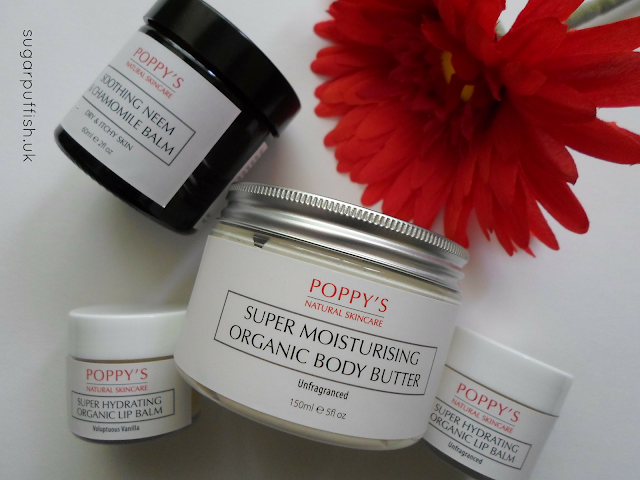 I’m happy with the four products I’ve been testing so I feel able to recommend Poppy’s Natural Skincare to readers. Poppy is also on hand to offer advice and more than happy to discuss your individual needs to find suitable products.